If you like Peach Tea, imagine vaping that delicious flavor. The inhale hits with a nice juicy peach taste, followed by the green and black tea flavor on the exhale to complete this amazing blend. Peachy Peaks - new ADV for me! I tested this liquid in 0, 3, and 6mg nicotine strengths. This juice is 60% VG so vapor production isn't going to be overwhelming. I would say they perform solidly when compared to other 60/40 blends and the vapor production is definitely satisfying enough. At 6mg the throat hit on this liquid is stronger than I prefer, but I usually vape 3mg. It's on par with other 6mg liquids I have vaped in the past. At 0 there is no throat hit and at 3mg there is enough of a punch to the throat that it is satisfying, but not uncomfortable. Other tea vapes I have tried have tended to have a dry kind of throat hit causing cotton mouth, but I don't get that at all from this liquid. 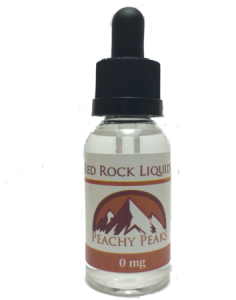 The vendor's description is pretty spot on and I am quite impressed with how naturally the peach flavor tastes. On the inhale I get a wet, juicy, naturally sweet peach that is absolutely delicious. I don't really get green tea notes so much on the exhale, but I do get a really nice unsweetened black tea that is sweetened just enough by the peach. The vape leaves my mouth feeling wet; the flavors linger quite a bit and taste delicious even after the fact. This is definitely an all day vape for me and I can't recommend it enough, especially if you are a fan of drinking peach iced tea.